Project Panels that range in size from 1 sq. ft. up to 8 sq. ft., either individually or in whatever quantity you like, from 1/4" to 1-1/2" thick. 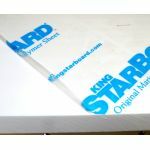 Quarter Sheets, each measuring 24" x 54" for thicknesses up to 1", and 24" x 48" for 1-1/2" thick material. Buy 2 of these of the same thickness and color, and get our half-sheet price. Or buy 4 and get our full-sheet price. Half Sheets, each measuring 48" x 54". Buy 2 of these of the same thickness and color, and get our full-sheet price. Full Uncut Sheets that measure 54" x96" for most thicknesses (48" x 96" forr 1-1/2" thick). Buy at least 3 sheets of any size and/or color and receive a quantity discount on each sheet.